“I couldn’t be more proud of what has been achieved here,” said Iain Flitcroft, Master Franchisee for Kvik in Asia. We met at their brand new Kvik store in Pattaya, located in front of Baan and Beyond, next to Big C South Pattaya, Sukhumvit Road. The showroom, which is over 250 Sq.M, is a Kvik flagship showroom displaying all of the Kvik Kitchen Ranges, together with a selection of their bathroom and bedroom furniture, including the newly launched, fully fitted, Sliding Wardrobes. 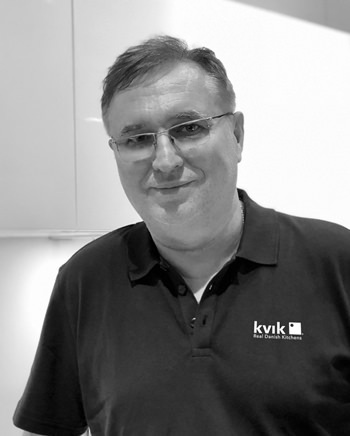 The Kvik Pattaya store is owned and operated by Jacek Paruch. Kvik represents the best of Danish design. With a huge factory in Herning, in the North of Denmark and over 160 stores throughout Scandinavia and Western Europe, Kvik has been producing high quality kitchens for over 32 years. Currently this factory produces approximately 1,000 kitchens per week. Kvik has been operating in Asia for the past eight years. The head office and flagship store is in Thonglor, Bangkok, with other stores in Hua Hin, Surat Thani, Rama IX Bangkok and Hong Kong. A fantastic new store in Ratchapruek, Bangkok will open next month and a store in Manila, Philippines, in June. In Thailand, Kvik positions as an accessible 100% import brand, bringing great quality, design and service at a price that is significantly lower than other equivalent imported kitchens and therefore affordable to a wider audience. Uniquely, all Kvik furniture is delivered from their warehouse in Bang Phli and as a result Kvik offers a 4 week lead-time as opposed to the 14 weeks or more that customers may have to wait for any other imported kitchen. This also enables Kvik to turn around spare parts or replacements very quickly, so not holding up the completion of the kitchen. Kvik is currently engaged in two schemes in the Pattaya area, Turtle Creek Residence – a scheme of 30 exclusive condominiums in Pratamnak Soi 4; and Sunplay, Bangsaray – an exclusive development of condominiums and private pool villas set in a beautiful tropical garden environment with views out to the sea at Bangsaray. For private retail customers Kvik currently has a fantastic deal on offer for the first 30 customers to buy from the Pattaya store with discounts of 30% on furniture. The Kvik – Real Danish Kitchens is now open in Pattaya displaying all of the Kvik Kitchen Ranges, together with a selection of their bathroom and bedroom furniture, including the newly launched, fully fitted, sliding wardrobes. The Kvik store at Baan and Beyond, Pattaya is open 7 days a week from 10am until 7pm call their showroom at 091 007 9275 to make an appointment.